Registrars Rescue Tacoma! - Seattle Professional art hanging, art moving and art consultant. Washington Museum Association was pleased t host its 2016 Annual Conference in the Museum District in Tacoma in late June. Preceding the conference, registrars and collections specialists from Washington museums, along with sponsor Art Work Fine Art Services of Seattle, gathered again for the Registrars to the Rescue even. Inspired by the density of museums in the region, the committee decided to take on two locations this fifth annual year. On June 22, 2016, seven volunteers joined the staff at Tacoma Historical Society under the direction of R2R co-coordinator Jessica Wilks and THS collections manager Claire Keller-Scholz to complete inventory and rehousing work that began with the relocation to their new facility in 2014. The team was able to rehouse 25 boxes of fragile objects and inventory, measure, and photograph 150 artifacts to help to ensure high quality, long-term care of the collection. 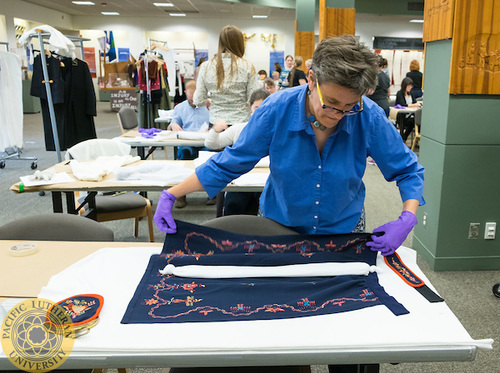 At the same time, across town, and unprecedented 22 registrars and collections specialists descended upon the Scandinavian Cultural Center on the Pacific Lutheran University campus. There, they were joined by Director Elisabeth Ward and nine volunteers from the SCC membership who brought their sewing skills. Together the teams built padded hangers (with custom stitched muslin covers) for 111 pieces from the Nordic costume collection. In addition to rehousing artifacts, the R2R volunteers were able to instruct the SCC members in the proper techniques to continue the project which will allow them to complete the work for the remaining pieces in the collection. WaMA President Joseph Govednik says, “We are gratified to know that our support will help ensure the long-term preservation of these important historical objects.” We look forward to planning for our sixth annual R2R event in Southwest Washington State in June 2017. WE hope that you will consider joining us if you are in the area. Thank you to Washington State RCWR state coordinators for helping to spread the word and bring such qualified volunteers to our event. It is truly amazing how our network of museum professionals comes together to support each other in the work that we do. Feature Photo: Elizabeth Mauro inserts stockinette padding into apron at SCC.